School meals are prepared freshly each day in our newly refurbished kitchen. Please use this link to visit the Surrey website and view menus for the term. 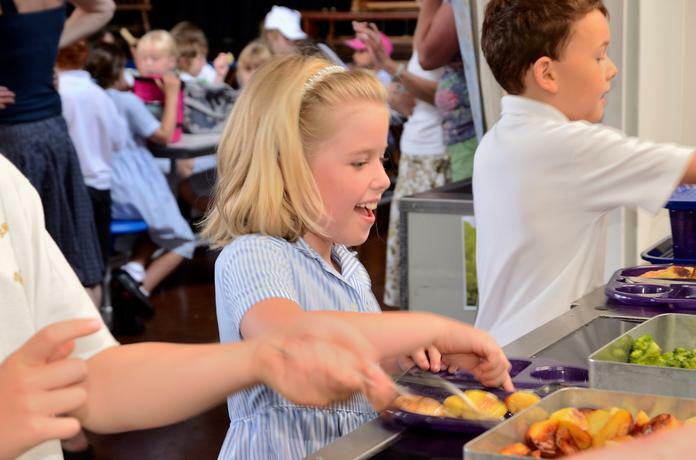 From September 2014 the Government made it possible for children in Reception, Year 1 and Year 2 to have a FREE school meal and we hope that parents take up this offer. Where payment is required, information is published each half-term in the weekly newsletter (SNS News). Meals should be paid for in advance. A week's written notice is required please for any changes to lunch arrangements and letters should be addressed to Mrs Tilbury. If paying weekly, money should be brought into school on a Monday morning and given to the class teacher in a sealed envelope and clearly marked with the child's name and class. Cheques should be made payable to 'SURREY COUNTY COUNCIL'. Refunds will be given for any meals not taken due to absence. It is also possible to pay for meals on-line and all families are issued with unique details to enable them to do this. There is a quick link below and on our Home Page to the Online Payment login screen. As an alternative, children may bring a packed lunch from home. We know however that only around one in ten packed lunches in England meet children's nutritional needs as it is hard to get the variety into lunchboxes (but much easier to do in a hot school meal). See the 'Healthy Eating' tab in the 'Learning' section for packed lunch ideas. Children in Reception, Year 1 and 2 are provided with fresh fruit daily. Other children may bring fresh fruit to eat in the morning break as we encourage only healthy snacks. Milk is also available free to children under 5 and at a small cost to parents of other children through the 'Cool Milk' scheme.